Two researchers from the University of Toronto find Canadian qualitative sociologists divided in their responses to research ethics boards. Judith Taylor and Matthew Patterson interviewed one qualitative sociologist from each of 21 of Canada's 22 PhD-granting sociology departments. They found that respondents fell into three general groups of "ethics orientations," which they characterize as "active engagement, apparent accommodation, [and] overt opposition." The angriest sociologists are "overt opposers" who "passionately defend unencumbered intellectual pursuit, sociological traditions of inquiry, experiments and innovations in inquiry, the primacy of sociological understandings of ethics, faculty discretion, and critical or autonomous sociology. 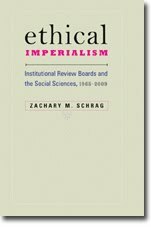 Such scholars see institutional ethical review as putting intellectually-credible human-based sociology and academic freedom in peril, threatening the nature and legacy of the discipline of sociology and the job of sociologists." Faced with IRB/REB requirements, they do whatever they can to resist, even deceiving the boards when necessary. At the other extreme, "active engagers believe regulators and practitioners can collectively manage conflicts by working together as virtual peers within the same committees and institutional settings." They welcome ethics review and may even serve on boards themselves. In the middle, "apparent accommodators accept the necessity of ethics regulation, but fret over the practical implications of these regulations for their research and teaching." This is the largest group, comprising ten of the 21 responses, with six opposers and five engagers making up the rest. As the authors note, this split means that while three-quarters of sociologists think ethics review is necessary, two-thirds of those are also engaged in "some form of resistance toward ethical oversight." Though Taylor and Patterson "argue that the ways in which academics understand and act toward ethical oversight is far more complex and variable than is represented in the current literature," the range of responses they report closely resembles the range of viewpoints I have reported on this blog and in my forthcoming book. For example, "Communication Scholars’ Narratives of IRB Experiences," Journal of Applied Communication Research 33 (August 2005): 204-230, are not broken down into categories, but they express views quite similar to those found here. More intriguing are Taylor and Patterson's explanations of why scholars think as they do. They attribute viewpoints to scholars' age and status, noting that "Overt opposition tends to be exhibited mostly by senior men in the discipline who began teaching in the 1970s or 1980s, although some senior women are also opposers. Overt opposers also tend to hold appointments at the most research-intensive and elite institutions." The more tolerant apparent accommodators "tend to be mid-career scholars at research-intensive institutions who share their oppositional colleagues’ analyses while also internalizing blame for the transgressions of their predecessors." And active engagers "tend to be younger, untenured women faculty with less than a decade of teaching experience, holding positions at less research-intensive universities." Taylor and Patterson suggest that as the youngest cohort, the engagers will inherit sociology. "As the generation of opposers retires and engagers increase in prevalence and power, the range of available orientations and methodological approaches may markedly narrow, with possible effects on the production of sociological knowledge." Another possibility, however, is that attitudes toward ethics boards reflect knowledge gained from reading and experience. Direct experience with ethics boards breeds skepticism. Only one respondent is quoted as having direct knowledge of sensible advice dispensed by an ethics committee: the suggestion of a "graduated consent form." But many faced inappropriate demands by ethics boards, either regarding their own research or that of their students. As the authors note, when accommodators "sense that those reviewing their ethics protocols do not share [their] understanding of sociology, they lose faith in the ethics review process." One or two incidents of "decisive trespass" may be forgiven. But the reality of ethics review eventually may wear out their trust. The only thing that keeps these frustrated accommodators from becoming opposers is their belief that "a history of ethical violation" by sociologists "prevents them from more outwardly opposing their boards." I would be curious to know just what the respondents believed about the history of their discipline, and how they had come to those beliefs. Do they get their history from historians, from sociologists, or from ethics boards? If attitudes toward ethics boards are shaped by experience, rather than status, then opposition may not fade as today's opposers retire. Graduate students may enter the profession as idealistic engagers. But as they pursue their careers, the missteps of ethics committees (and perhaps a better grasp of history) could drive them into the camps of accommodation, then opposition. Today's engagers may be tomorrow's accommodators, and today's mid-career accommodators could be tomorrow's senior opposers.